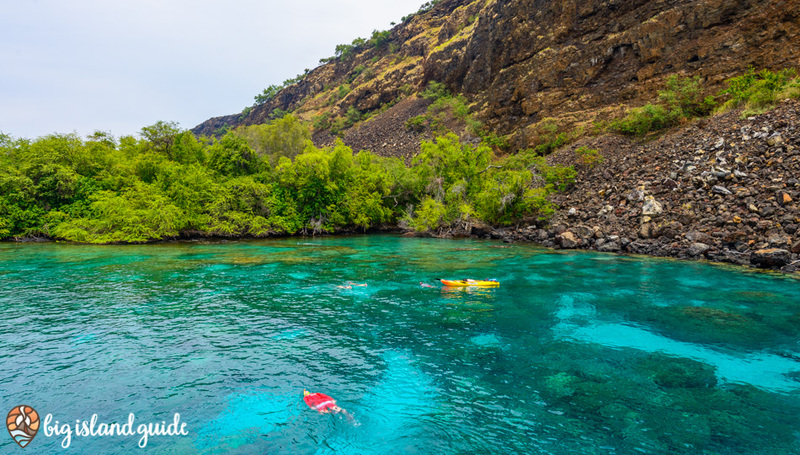 Known to the locals as “Two Step,” this snorkeling site is incredibly popular, and for good reason – it’s among the best snorkeling spots on the Big Island. Two Step derives its name from the natural rock step at the water’s edge that serves as a perfect access point for fin-wearing visitors. The Snorkeling here is incredible with large schools of fish, lots of varied terrain, healthy coral and a wide variety of other sea life. There’s no beach, but there is plenty of space to have a picnic on the lava rock shelf under the palm trees. This area is easily accessible, but a little out of town, so bring water and a lunch or snacks and plenty of sunscreen. There is a porta-potty and a few picnic tables, but no other facilities or showers. You are very close to Pu’uhonua O Honaunau National Historical Park so stop by and check out the amazing Hawaiian history across the bay. A pristine marine preservation site bursting with colorful sea-life, dolphins, and coral, the bay is well-known for its snorkeling. The bay is somewhat protected by lava formations that keep the water relatively calm, but windy afternoon conditions and chop can occasionally result in difficult swimming, especially in the winter months. Because of the historical and protected nature of the surrounding area, access to this bay is closely controlled. 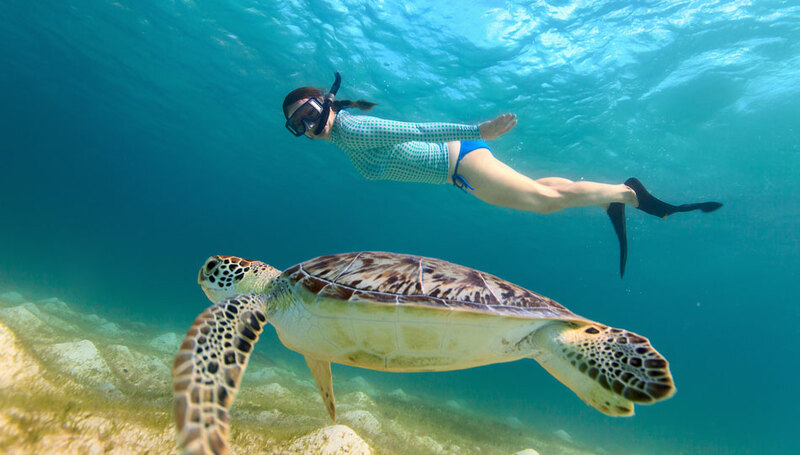 Your easiest option is to take a snorkel cruise or kayak tour to the area with one of the tour companies that are licensed to take snorkelers to the bay. If you want to try it alone, there is a strenuous hike down the cliff that allows you access to the bay or you can get your own permit and rent a kayak. You aren’t allowed to land your kayak in the bay though, so you will have to get in and out of the kayak in the water and keep it tied to you as you snorkel. This one is worth the tour, just make sure that the company you choose actually goes into the bay. Some less scrupulous vendors will make you think you are going to the bay, then take you just outside the area, and it just doesn’t compare. 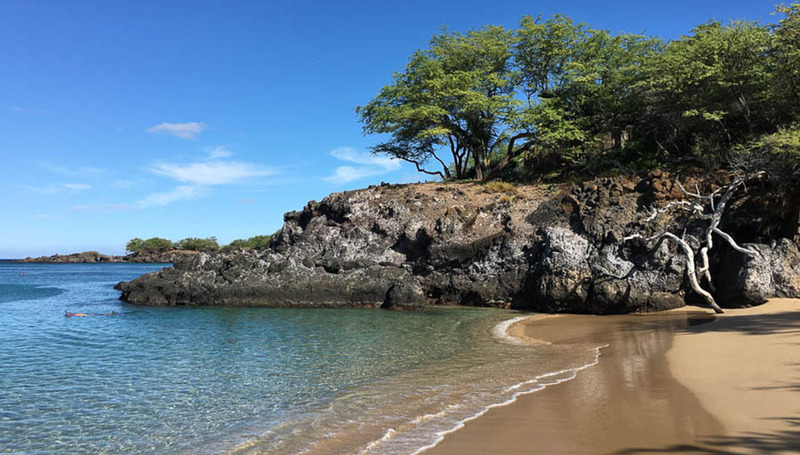 A fun and family-friendly beach with coarse, but gentle salt and pepper sand, Kahalu’u Beach Park’s better known for its snorkeling and surfing than its beach. 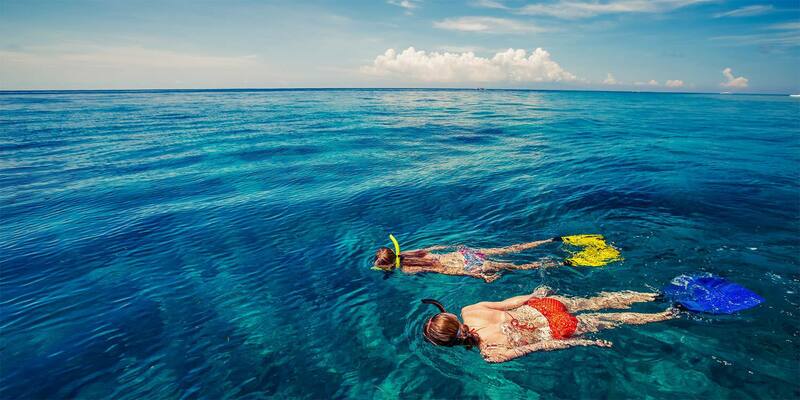 Well-protected from aggressive waves and boasting shallow, crystal-clear waters, this is a great place for beginners to get used to the water or for experienced snorkelers seeking a perfect underwater shot. With its convenient location right in Kailua-Kona, it’s easy to fit in a quick morning snorkel before you head out for other adventures. Green Sea Turtles tend to like feeding in this area so you have a pretty good chance of running into some. Waialea Bay Beach is just a few minutes south of the wildly popular Hapuna Beach and as such, it’s an incredibly popular site for tourists and locals alike. 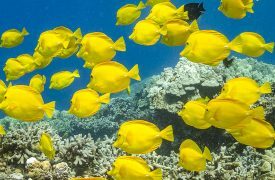 It can get very busy, especially as the day goes on, so it is worth showing up early to catch the best snorkeling. The gate is open from 7 am to 8 pm. There are showers, restrooms, picnic tables and shade at this beach. Snorkeling is good in several locations across the bay, both the northern and southern edges as well as the rockier area in the middle. Due to the shallower water, you have good visibility throughout much of the bay, but watch for surges when you are near the rocks in the center. You will see lots of types of fish, some healthy coral formations, some unique lava flow terrain and possibly some turtles. 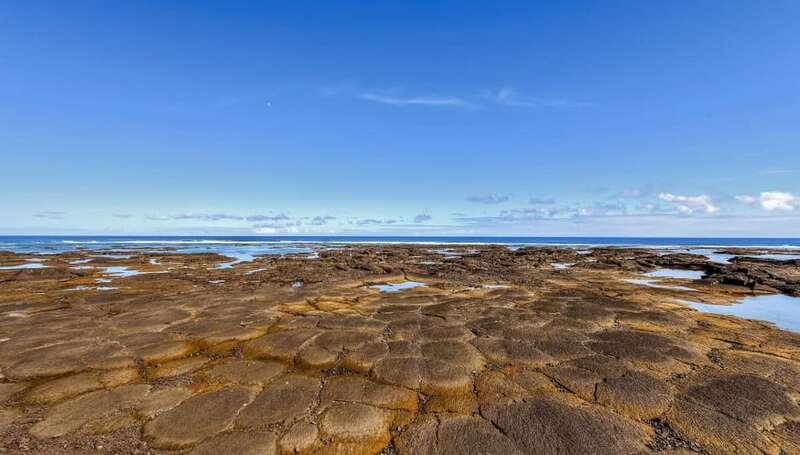 The Kapoho Tide Pools have been dramatically affected by the 2018 Volcanic Eruption of Kilauea. Sadly this amazing snorkeling location has been covered by the active lava flow originating from Fissure 8 and is closed to the public. The incredible interconnected tide pools, that made a network of unique swimming holes and played host to tropical fish of every sort is gone. It is truly sad to have lost this unique marine habitat, and only time will tell what the area will be like in the future. Most of this shoreline is now covered in new lava or black sand created by the new flow. 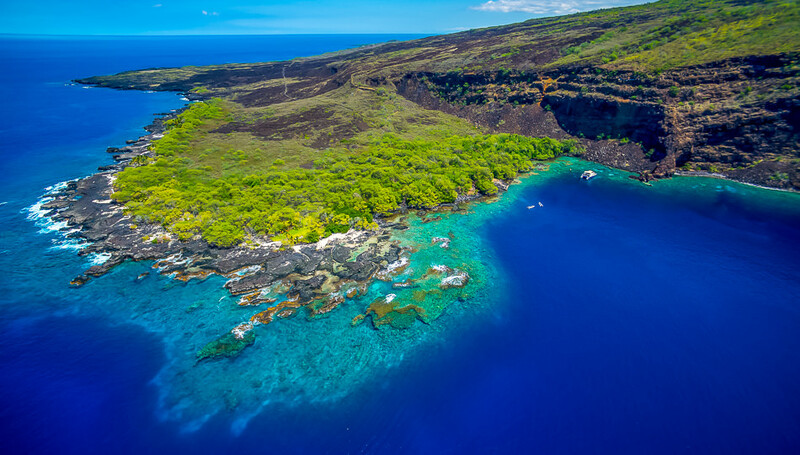 The Big Island of Hawaii is constantly changing and that includes our reef habitat. 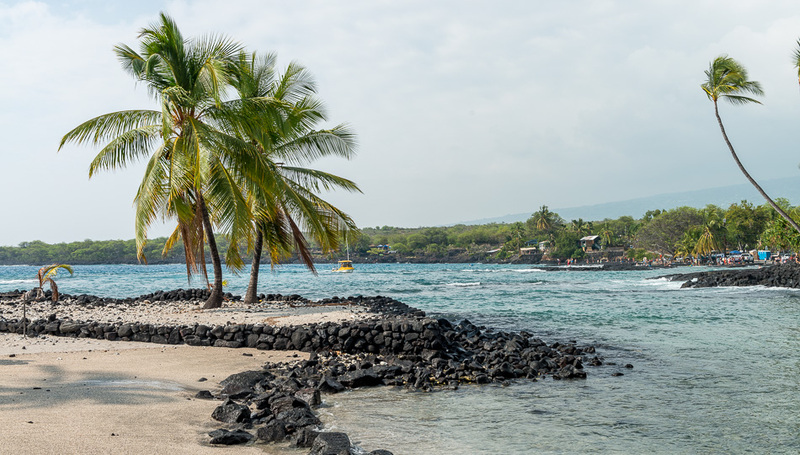 Now that you’ve learned about some of the best snorkeling on the Big Island, visit our complete Big Island Beaches guide to learn more about other great beaches on Hawaii Island. World-renowned for the quality and consistency of its beans, Kona Coffee alone is worth a trip to the Big Island. One of the most prolific and visible gear rental companies in Hawaii, Snorkel Bob’s has earned its reputation for quality and expert insight to ensure your visit is exciting and memorable. 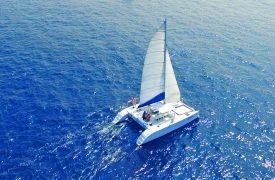 Equipped with a luxury catamaran vessel that cruises the high seas with ease, Paradise Sailing Hawaii is an incredible, high-end tour experience that you’ll never forget. 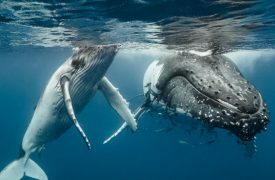 Should you find yourself on the Island of Hawaii, whale watching is an unforgettable experience that will be a highlight of your vacation.